Parkinson’s, their partners and carers. The aim is to share experiences and discuss the practical and emotional impact of Parkinson’s. 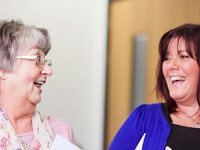 A ‘Path Through Parkinson’s’ is a self-management programme starting in Sheffield in May designed to help you plan how to navigate life with Parkinson’s.